A new speaker range; a new drive-unit material. Focal’s Aria 900 line-up makes its début this weekend, and judging from the Aria 926 floorstanders (above) I’ve been using for the past couple of weeks, the French speaker company could be on to something rather special. 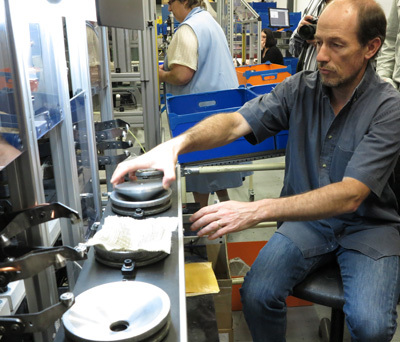 New materials are the lifeblood of the loudspeaker industry. There’s not too much you can do with the established design elements of drivers and a box (however it’s shaped), so hardly an announcement of a range of speakers goes by without some claim of an innovative choice having been made for cones or domes. There’s everything from Kevlar to carbon fibre to metal/ceramic to a novel coating or doping or formulation, each one apparently a breakthrough and offering standard-setting performance. 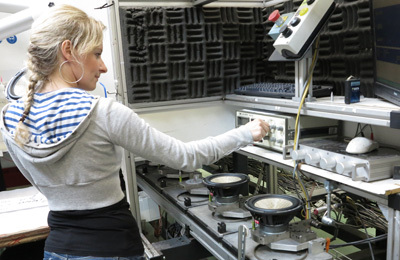 French company Focal is no stranger to this kind of development: it has a clean-room/hazardous material chamber in its factory dedicated to the manufacture of its beryllium tweeter domes by an employee in a ‘space suit’. It’s also for many years made its V and W sandwich cones, so-called due to their use of glass layers – V is for ‘verre’, while of course ‘W’ is ‘double-vee’ in French, indicating the use of double glassfibre layers – , not to mention its Polyglass designs, using microscopic glass spheres on the surface of a cone. The high-precision, highly-skilled manufacture of the ‘W’ cones starts with the stretching of heated layers over metal formers (left), and is both labour-intensive and time-consuming. That’s why Focal has long been looking for alternatives for its more affordable speaker ranges, and it’s just come up with a new speaker technology. Actually, its latest material is a very old one: flax. Not only is this a traditional French product, grown in Flanders, Picardy and Normandy, but the country is also Europe’s main producer of flax, the source of the top-quality French linen fabric used worldwide by the fashion industry. Doesn’t sound like the most obvious material from which to make speaker cones? Well, the flax fibres are as rigid as Kevlar, as stiff as carbon fibre, light, self-damping and yet the material made from them is easy to use in automated manufacturing. A bundle of flax fibres, used to make thread for spinning, is typically 10-40 fibres, with each fibre around 10cm long, Each of those is a single, very elongated cell, with a diameter of 7 to 40 μm, and composed of 70-80% cellulose. 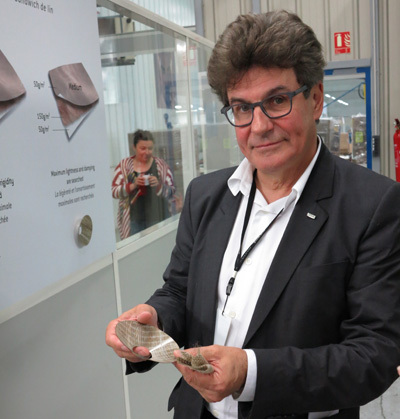 And it gets better: because each fibre is hollow, it’s half the weight of glass-fibre, and its very low elasticity makes it ideal to increase the rigidity and resistance to flexing of a sandwich cone-construction. 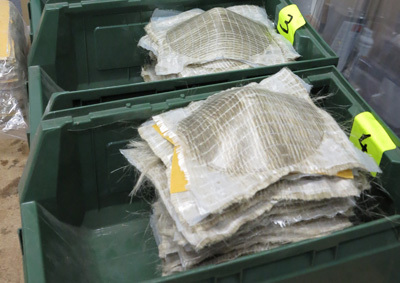 The fact that the raw material comes in non-woven bundles allows it to be used to create the thicknesses required for the sandwich drivers, and of course the fact it’s a natural product, and thus not prone to the vagaries of the oil market (which produces the petrochemicals used in many applications), makes it doubly attractive. You may have got the idea now that Focal quite likes flax, and the material also suits another of the company’s requirements in its hunt for a new range of drivers to slot between its Polyglass drivers and the pricey-to-make ‘W’ sandwich cones used in its high-end speakers. By contrast with the W cones, it’s much simple to make the new Flax cones on a semi-automated production line, from initial layering of the sandwich through to final testing. Or, as Focal MD Gérard Chrétien (left) puts it, ‘The W cones have to be handmade; with this, it’s pff, pff, boom – and it’s done’. The new drivers use 0.4mm fibreglass layers sandwiching a 0.4mm woven flax core, and by varying the density of the layers different characteristics can be imparted. In woofers, for maximum stiffness, the fibreglass layers are of a 100g/sq.m material, and the flax 250g/sq.m; for midrange drivers, requiring lightness and maximum damping, 50g/sq.m fibreglass sandwiches a 150g/sq.m flax core. 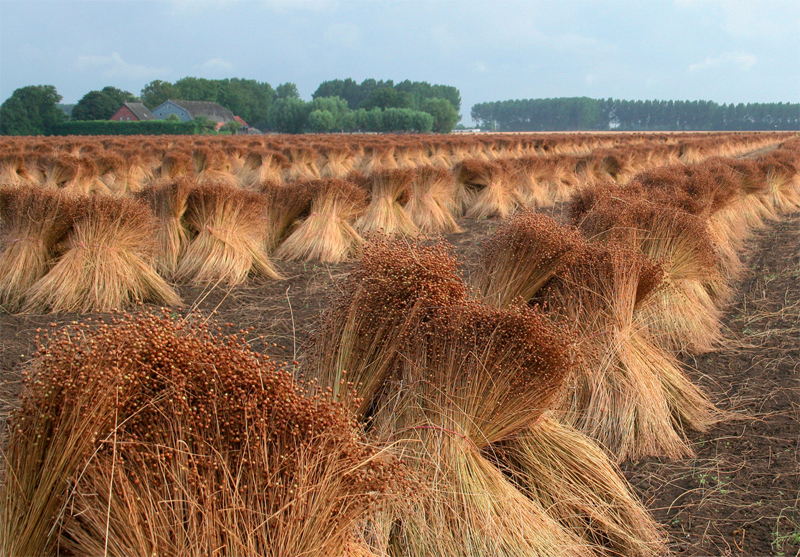 There’s an extra appeal to using flax: it’s a renewable resource, thus boosting the company’s eco credentials. And even without reading the description on the trim-rings, there’s no mistaking the new ‘F’ sandwich drivers: they have an unusual ‘woven fabric’ look to them, in a ‘natural linen’ colour – mainly because they’re basically woven natural linen. Or at least the fibres used to make linen. The drivers also have a new cast Zamak (zinc/aluminium/magnesium/copper) basket, designed for a free flow of air behind the cone, and an optimised magnetic ‘motor’ , and the first speakers in which they’re being used is Focal’s all-new Aria 900 range. Actually, the drive units were first launched as part of the company’s in-car range of speakers, designed to slot into the factory speaker locations as a simple upgrade for a range of vehicles. The first F drivers for those applications hit the shops a month ago: now there’s a complete range of domestic speakers using the new cones, too. 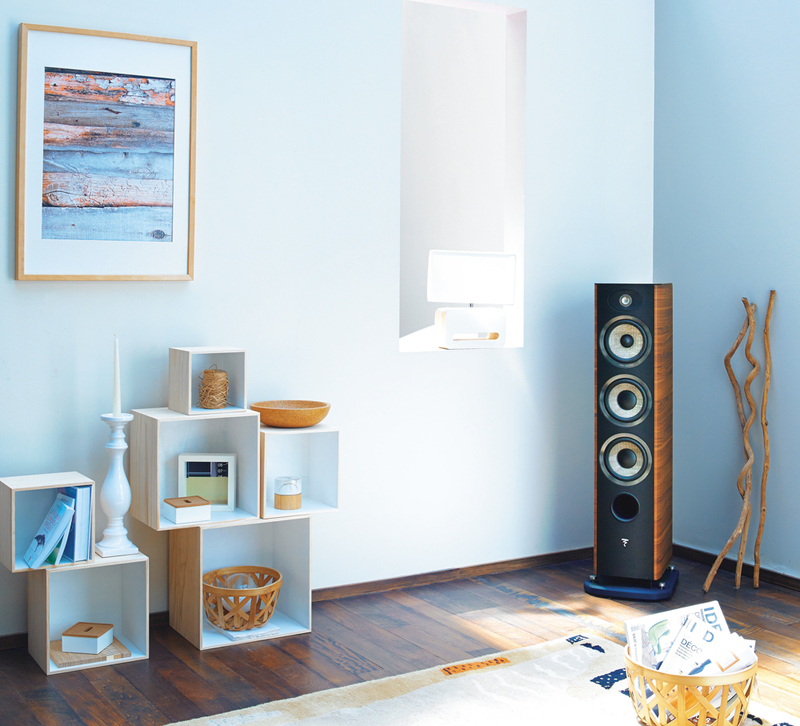 The initial offering is five models: the bookshelf/standmount Aria 906, seen right with the floorstanding 926; the 936 and 948 floorstanders; and the CC 900 centre speaker. Coming in the first quarter of next year are three more Aria 900s: a smaller bookshelf model, the 905; a more compact floorstander, the 916; and a surround speaker, the SR 900. Pricing for the first models starts at £800/pr for the Aria 906, with the Aria 926 floorstanders I have been trying for the past couple of weeks at £1800. Those prices are in walnut finish: black high gloss adds £100 to the Aria 906, and £200 to the Aria 926. The 926 is a three-way design, and there’s more to the speakers than just the flax drivers: this is an all-new design, from the TNF tweeter, with a suspension system developed from that used in the range-topping Utopia speakers’ tweeter, through to cabinets designed and engineered for the range. One of the benefits of the Focal way of doing things – ie making everything from drive units to finished speakers for all of its models except a few of its ‘lifestyle’ products – is that crossovers can be kept simple, as the drivers are both made for specific speakers and mounted in enclosures designed to make the most of them. In the 926, the tweeter is a new design for the Aria 900 range, a 25mm inverted aluminium/magnesium alloy dome mounted using a Poron ‘memory foam’ suspension into a waveguide designed to improve horizontal directivity, and thus stereo imaging. Below this is a 16.5cm flax-cone mid/bass unit, and then a pair of 16.5cm bass drivers, also with flax cones: the midrange hands over to the tweeter at around 2.4kHz, and to the woofers in the region of 290Hz. The cabinets have non-parallel sides to break up standing waves, and are designed to be very rigid, combining 18mm and 24mm MDF and strategic bracing. That ‘timeless sobriety’ Focal talks about extends to the leather finish on the front baffle and the glass top-plate, while these floorstanding models sit on a hefty diecast aluminium plinth, this having the dual function of adding stability and providing space into which the downward-venting bass port can operate. That’s actually one of two ports the speakers use as part of what Focal calls a ‘Powerflow’ arrangement: there’s a forward-venting one for speed and impact, and the downward-firing one for extension. In the usual manner of such press events, I first heard the Aria 900 speaker range at the Focal factory in Saint-Etienne, France, a couple of months ago; also in the manner of such events, the listening came at the end of a long day involving an early start, too much time in a minibus, several presentations, an exhaustive factory tour and a typically French extended lunch at the Musée d’Art Moderne de Saint-Étienne Métropole. Hey, I’m not complaining – after all, I’m sure a lot of people had a tougher day at the office – but it’s safe to say the enthusiasm levels were flagging a little by the time we moved on to the Arias. Listening to the speakers – and some of the bigger models in the range – certainly put that right in very short order. These are some of the most direct and communicative speakers I’ve encountered for a very long time, and above all they’re huge fun to listen to. The 926s here were the smaller of two floorstanders we were played in the Focal listening room, and instantly grabbed the attention; the larger ones – the 948s complete with 20cm bass units – were an absolute riot. That meant I couldn’t wait to have a play with a pair of Arias at home: it’s rare for me to have so instant a reaction to the sound of a range of speakers. Over the course of many years of listening, I’ve got used to having to work hard to nail down the differences between different speakers: they’re usually easy enough to hear, once you’ve run some familiar tracks through a couple of times, but putting them into words is the tricky bit. And that’s especially true of you’re also trying to avoid falling back on some of the lazier reviewing clichés, from ‘trouser-flapping bass’ (which surely went out when loon pants were abandoned some time around the mid-1970s, but I guess may have been revived when chinos came back in) to windows being cleaned and flung open. None of that old nonsense here: I just hooked up the Aria 926s to a range of amplifiers – single-wired, you’ll note, as the new Focal range has no truck with multiple runs of speaker cable –, fiddled around with the positioning a bit, sat back, and started enjoying the music. The speakers come with substantial screw-down spikes able to be deployed for use on carpet or wound back into rubber feet for use on solid floors, but along with the review pair (which had already been trucked round a good number of retailers as Focal’s early sales sample) came a little plastic bag containing some sharper spikes, enhanced carpet-piercing for the use of. Having bolted the plinths onto the cabinets, I tried the original spikes, put them back in the box and installed the sharp ones, then set the speakers up in the orientation I usually choose – just a shade of toe-in, sufficient that the outer side of the cabinet can just be seen from the listening position. The trusty Helix school protractor I found in a box the other day, along with the rest of a slightly rusty geometry set, tells me that’s a bit short of 10 degrees off a dead-ahead ‘firing straight down the room’ position. Amps in use for testing included the Creek Evolution 50A (reviewed here), a Naim SUPERNAIT 2, an Onkyo TX-NR818 AV receiver and a NaimUniti 2 all-in-one system. Source components included my current reference network music player, the Naim NDS/555 PS, the optional Ambit tuner stage for the Creek amplifier, and elderly but still superb Audiolab 8000T analogue tuner, and an Esoteric K-07 SACD/CD player, this last doubling as a DAC for music played from my MacBook Air laptop. Cabling (apart from the Naim Hi-Line between NDS and SUPERNAIT 2) was all from The Chord Company. Right, that’s all the housekeeping done, but beyond that all there really is to be said about the Focal 926 speakers is that they are a constant delight. Play just about anything through them, from speech radio podcasts to high-resolution files played on the NDS, or through the Esoteric over USB, and there’s just one simple emotion to be had: if your listening experience of them is anything like mine, it’ll have been a long time since music has sounded so uncomplicated and enjoyable. Well, almost anything, as fast as taps on a screen can take you. There’s punchy, ‘gets you where it matters’ bass on offer here, both fast and well-extended; a seamless transition into the midband with no suggestion of drive units passing the baton between them, and a treble that’s both sweetly controlled and capable of beautifully clean imaging and ambience. Listening to the Aria 926s for a couple of weeks was fascinating, and actually reminded me of the fun I had with a pair of Tannoy DC2000 speakers more than two decades ago: they didn’t take much power to get them moving, sounded clean even when pushed, and were deep, fast and exciting with their 20cm Dual Concentric drive unit and woofer of the same size. They were great party speakers, great ‘listening to rock in the dark’ speakers, and made everything you listened to through them exciting and involving. I’m sure the Focals are rather more refined than I remember the Tannoys being, but they have many of the same characteristics: there’s an uncomplicated ‘rightness’ about their sound, and best of all they make you want to keep on listening to more and more music. Or radio. Or whatever. I can honestly say I can’t remember when I listened to so much music and so many podcasts and plays and everything; I feel like I may have taken root on this sofa, and have to keep on dragging myself off to do trivial things like make a drink or sleep. My mental jury’s still out on the look of the flax drive units when the 926s’ magnetically attached grilles are removed: they’re certainly distinctive, but at times I catch sight of them and they have a little too much of the coarse-woven planet-saving reusable shopping bag about them, despite the high-quality trim-rings around the drivers and the textured front baffle. Oh, and having seen both the walnut and high-grade gloss black versions in the flesh, as it were, I have to say I think the premium finish is well worth the extra money: these aren’t huge speakers, but the walnut finish makes them look a bit boxy, while the gloss black is rather more slimming. That aside, however, the Focal speakers have required no acclimatisation, no allowances to be made for them, no ifs and buts and if onlies – they came out of their boxes, got placed in position, and they have simply worked beautifully, regardless of the electronics with which they’re partnered. I wasn’t surprised to hear that quite a lot of the final development of this range was done with Naim’s DAC-V1/NAP 100 DAC/preamp and power amp, and I’m sure the entry-level Aria 906s would make a pretty potent small-room system when used with the desktop Naim duo. Mind you, so would these 926s, based on the listening I did with both an original NaimUniti and the new NaimUniti2. Fired up with the Onkyo AV receiver, they delivered ‘do we really need a subwoofer?’ levels of low-end slam, and were enough to have me wondering how a system using these speakers with the dedicated centre and surround models is going to sound: their high sensitivity (91.5dB/W/m) ensures they make the most of any amplification with which they’re used, but they don’t half go some when you hit them with some decent amplifier power. These are gloriously enjoyable speakers, and if the rest of the flax-toting Aria 900 range is up to this standard, Focal could well have a serious sales success on its hands. As you know I’m a fan of the 700 range (ones I’ve heard) so the new Aria looks very interesting indeed, especially the standmounts. One thing that’s always struck me about Focal is there finish. They look fabulous. Do you think the Unitilite will be out of its depth with these speakers? The UL should be fine as long as you don’t have a huge room and don’t want to play music at ear-splitting levels all day. The NaimUniti2 would be a better all-round bet, however. i have a pair of focal chorusv speakers that i purchased five years ago and i am seriously thinking of upgrading to one of the new 900 series in a similar price range and i want know how much of a difference i would have in sound quality that i would use along with my audio research amplifiers and cd player. they haven’t arrived yet in toronto so i can’t make a valued judgment about this. thanks very much. Just purchased the 926’s plus Uniti2 setup after having tried the kef r700’s with the Uniti2 and both speakers with my ancient quad 44/405-2 setup. Brief observations – the look and finish of the kef’s are streets ahead of the focals but I couldn’t live with their sound (which gave me a headache) despite trying them at home for 10 days. I’m sure other people would find them wonderful though. The focals I demo’d were simply as Andrew described them – they made you want to keep listening and to turn them up. They were magical with the Uniti2 and made me buy the package rather than just the speakers I’d originally been looking to get. I’m honestly can’t remember hearing such an engaging sound from a HiFi setup for years. I urge you to go and listen before the offer finishes. 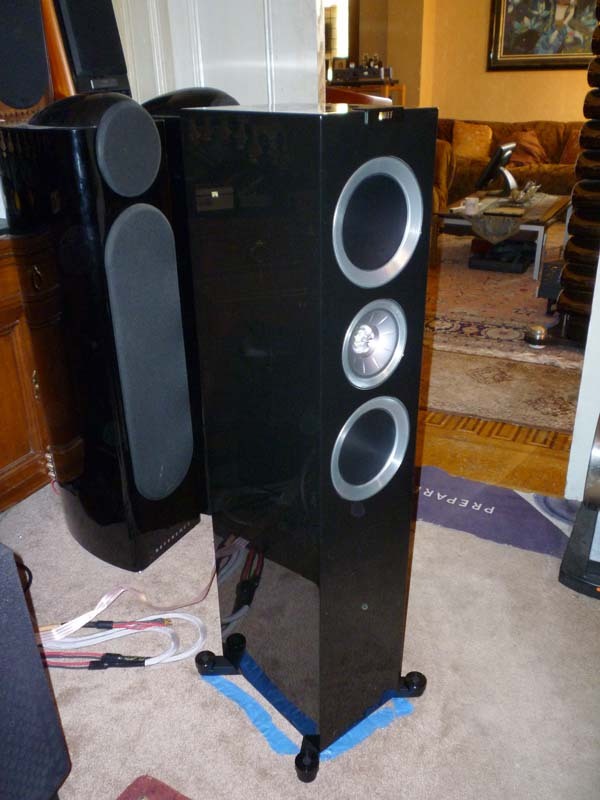 This is a complete bargain at this price for the pair -and no, I don’t work for Focal or Naim. You’re saying that these plain looking R700 from KEF are better looking than the Focals?! Very much doubt many would agree with that. I much prefer the look of the drive units on the KEF R700’s but now my piano black 926’s are here I think there is little in it. The 926’s look better once the grilles are in place, the KEF’s without the grilles. Anyhow that’s just personal aesthetic taste. On the sound front the 926’s and Naim have been playing for about a week now, and I have gone from listening to virtually no music over the last 15 years or so to being addicted. I guess this is just the honeymoon period right now but I couldn’t be happier. Especially as my only real upgrade route is to change the speaker cable – which I probably will do as I don’t think the QED micro cable I have right now is doing the lower end justice at higher listening levels. However for normal background listening I cannot find fault – even at just ‘1’ on the Naim volume control late at night the system still sounds alive. I’m in a very good place with this system right now. Thankyou Andrew for such an enjoyable read – I have just bought a pair after a home demo to replace my Naim Ovator S400s – which might seem like a backward step… The S400s are supreme with some songs but I need something a bit easier going with which I can enjoy all of my music collection not just the stuff which was well mastered. Your review inspired me to try the Focals and I loved ’em – just as described. Glad you like them, Will! Hi Will, did you get the chance to audition also the 948 model ? Do you reckon it’s worth the extra penny ? Thanks for your input, made the 926 even more attractive. Andrew, nice review. A question on the tweeter. It appears from cutaway illustrations, to not have a rear chamber. Is this true? If so, it seems more like a measure to pave the way for a future luxury version, rather than a cost cutting measure…maybe I’m speculating too much on that, though. 2.4 kHz is very low for a tweeter with no rear chamber. Not saying you can’t get decent sound without the chamber, but having one is that much better. Btw, how would you compare these Aria to B&W’s similarly priced line? To my ears B&W’s aluminum tweeter is not friendly to solid state receivers, etc. Both the tweeter and the midrange driver operate in their own enclosures within the cabinet, these enclosures being designed with non-parallel walls. I’m not aware of any plans for a future ‘luxury’ model, but have no problems at all with the sound of the tweeter, or indeed the whole speaker, as it stands. I haven’t done any direct comparisons between these speakers and models from the B&W range. Nice review, I use focal Electra 1038 be’s. Have u ever heard these loudspeakers? If so how does new Aria compare? 2.5 months on, and with Naim NACA5 cable now connecting them to the Naim Uniti2 (tightened up the bass considerably), these speakers are still a constant delight. If you are in this price range for speakers I urge you to listen to them. The key word in all the reviews of this speaker is ‘fun’. The speakers aren’t perfect but they connect you with the soul of what the performer was trying to convey. I think this speaker is at the point of where the room itself is likely to be as important to the sound you hear. thank you for the excellent review, looks like a great speaker set. do you think they represent significant enough of an upgrade from Monitor Audio RX6 ? (if you heard them, of course). would you reckon it’s worth spending the extra and just getting the 948 ? would remove the temptation for another upgrade I guess. Well, I found the 948s hilariously good on a brief listen at Focal HQ, but I haven’t had the chance to spend more time with them yet. Certainly worth a comparative listen if you’re auditioning the 926s. Regardles the Price , but does the Focal Aria match with the soundquality of the new B&W CM10? Andrew, how do the focal chorus 836v speakers which I have compare to the new aria 926 models, since they are in a similar price range? I am thinking of upgrading to the 926s and would appreciate your comment. thanks very much. Not a direct comparison I have done, but I think the 926s are very competitive with other designs I have heard at this kind of pice, and I’d urge you to have an audition. thank you very much for your reply. by the way, I just picked up the new aragon 8008 solid state power amplifier and I find it has excellent sound and if I ever want to upgrade in the future, I am thinking of getting one of the pass labs power amps because I understand they make an excellent power amp also. I see you also write about classical music and I have been collecting music by rare and unknown composers,(eg.eugene d’albert, ignaz brull, hans rott, karl goldmark,moritz moszkowski,julius rontgen,johann wagenaar, alexander Scriabin’s first three symphonies,cyril scott,percy sherwood) and their music is so beautiful that I don’t understand why it is never performed in concert halls as far as I know. it’s an interesting topic for discussion because many of these composers have written absolutely wonderful orchestral music that deserves to be heard in concert halls. thanks again. I bought the speakers after reading all the reviews. I have listened to them for 2 weeks now and they are all they were promised to be. This is the best set of speakers I ever had. Well I just had to jump on here and share my excitement. My my modest standards I decided to push the boat out and buy a ‘real’ HiFi system. So I did lots of research, read yeps of reviews and finally went out and bought a Cambridge 751R, Cambridge 752BD, Focal 926 (front), Focal 906 (rear), Focal 900 (Centre) and an REL T9 Sub-woofer. I then plugged in Carlos Santana, cranked up the volume and it was absolutely fabulous. The total system is magnificent and speakers are just stunning. For under $4000, they are ridiculously good. 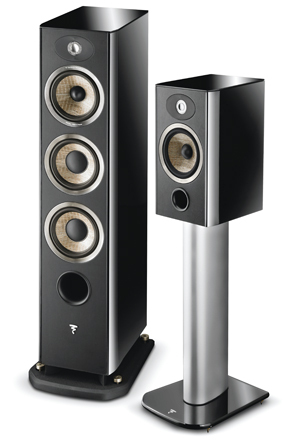 UK, Just bought a pair of Focal Aria 926’s in gloss black finish. Main source Rega Apollo through a Rega Cursa into a Bonnec Alto. Spectacular finish and sound performance for the money. Personal choice of course, but not heard anything as versatile for the money ! UK – My brother has a pair of 1028 Be and he loves them but my budget only stretches to a pair of Arias to go with my AVI amp and Michell Engineering Orb SE . My old Rogers LS6a2s died and I only have a small pair of Wharfedale Diamonds as temporary and it’s killing my LP collection..Anyway, any advice on the Arias will be great. I’d definitely audition the 926s, and I have heard good things about the smaller standmount model, too. hi Andrew, I have the Aria 906 and they are also amazing. I’m tempted to upgrade to 926, do you reckon these can be driven by a full tube amp given how much their impedance drops ? (I’m currently running a 85WPC hybrid from Unison Research). Thanks ! Great review. Most helpful so thank you. Thinking of replacing Rega RS3s with the Aria 926. I have a Rega Elicit R and Rega Saturn R, along with a VPI Traveler/PSAudio phono stage. Any reason why the 926s shouldn’t be a significant upgrade? I also use a REL R305SE – will the 926s need that support? Canada here – I had purchased the revamped Chorus line for my home theatre (716 floor standing, CC700 centre and SR700) powered by the new Anthem MRX 710. After reading your review, I went back to my dealer and upgraded the front speakers to the new Aria line (936 floor standing and CC900 centre). No offense against the Chorus line but listening to the Aria line is like night and day. When I plugged the Arias in and listented to some acoustic CDs, I said to myself “This is how music should sound”. I also have a pair of these 926’s and all i can say is everything about the review is true….Had them since Feb 2014 and i’ve played eveything through them, this includes hymms, other world religeon stuff, jazz, rock etc etc and they sound superb everytime. Powered by a Pioneer LX85. Bought the 926. I really do not like these speakers. They sound like $300 polks to me. Yes more detail but they have absolutely no kick and no midrange. Snare drums that go thwack on other speakers sound like paper on the Focals. The bass is boomy and uncontrolled and with anything complex its a big smear. Lead lines can bare be heard whereas on other speakers I hear them fine. I really do not like anything but the looks of the Aria. They are expensive but do not sound expensive. I have heard Best Buy house brand with the same tonality. You know small, thin and sizzly with no authority. Why did you buy them if you don’t like them? Spending this sought of money, you really should of had a home demo. Still, a lesson learnt for the future. You never know until you get them in your own environment. This is not a contest of ego. I simply think they are the equivalent to polks at the big box store. Wrapped in a nice cabinet and tagged at 10X the price. Sound proves this to me without question in my experience. But each can make up their own mind. This was simply my point. A home demo would have saved you buying speakers you don’t like. Nothing to do with ego, just a sensible approach to buying speakers. Well guess what people? After much headscratching I discovered my Focal Aria 926 were wired backwards. That’s right, the + on the cup with the red terminal .. well it is not plus. They wired BOTH my speakers backwards at the factory. Therefore the speakers were moving inwards not outwards. Not only does this make speakers sound off in many ways but it can seriously harm high current amplifiers. So much for quality control and testing everything twice. After having all kinds of problems I decided to do the 9v battery test. The plus and minus are reversed on the Focals and this is absolutely BAD at any price point. Anyone who wants to verify is free to do so. I will show anyone. Sorry to defuse your revelation, but yes, the bass units are wired incorrectly in absolute polarity terms – and quite deliberately. Like most Focal designs, the Aria 926 uses a second order crossover, and to get the best ‘knit’ between midband and low frequency in the crossover area requires one of the drivers to be ‘out of phase’. 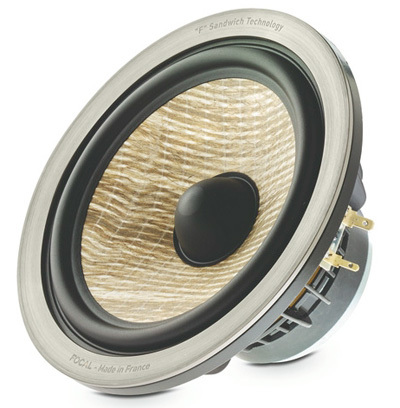 Focal chose to make the bass drivers the out of phase element in order to keep the critical midband in phase with other speakers in a multichannel system. This kind of approach is quite common in real-world speaker design. By the way, your assertion that ‘Not only does this make speakers sound off in many ways but it can seriously harm high current amplifiers’ is technically completely wrong. So while we may have to differ in our subjective impressions of the speakers – I assume the pair you have has been run in? – what your 9V battery ‘test’ has discovered is not poor quality control, but an intrinsic part of the design of the speakers. No … that is not true. That’s like driving in reverse and saying its OK.
By the way, the mid band is also out of phase with other speakers in the system. A kick drum does not sound good being sucked in. There are tons of papers on the subject. Further, many crossovers use electrolytic. Run those backwards and see what happens. Sorry but if this is by design its a very poor design. If Focal did this intentionally then I just don’t agree at all with the sound or design. I’m not sure what your ‘No … that is not true’ refers to, but if you’re saying that the information I got from the designers at Focal is untrue, then I am afraid we don’t have much more to discuss. You are, of course, entitled to your opinion of the design skills of the Focal engineers. No-one is saying anything in the crossover is being ‘run backwards’, and if you feel connecting the whole speaker in reverse polarity sounds better to you, then so be it – enjoy! As I said, we will have to differ on the sound of the speakers, as I found none of the problems you seem to have with them, as is clear from my review. No I am not saying the information you got is untrue. I am quite certain you have more information than I. What I can tell you is the mid and bass drivers within the speakers I have are in phase with each other. They are out of phase with everything else I own. While it may be their intent to wire woofers out of phase, I do not like that one bit. It sounds terrible in my opinion. A woofer kicking back? Why? Where I reverse the leads and the speakers are now in phase it sounds better in my opinion. But now with the information you have provided I am simply confused as to whether these speakers in my possession were wired to factory spec. I bought these for over 3k. I most certainly would prefer to like them. Unfortunately they have been no fun and underperforming. I don’t like taking things back. Believe me, I’d rather love them and enjoy vs what lays ahead. If you believe your speakers have been incorrectly manufactured, it’s probably best to return them to the supplying retailer, who will no doubt be happy to check them over for you. I’m really not sure what point you are trying to make now, although your comments above overlook the fact we’re talking about AC in a speaker system, not DC, and it’s also impossible to know what has happened regarding absolute phase during the recording process. As I said, it’s not unusual for speakers to have one or more drivers wired out of phase in order to smooth out crossover transitions, or for reasons of alignment when different driver locations/porting techniques, etc., are used. If you are dissatisfied with the speakers I again suggest you return them to the supplying retailer, or if you would like to send me your email address via the contact form on my About Me page, Focal has offered to contact you directly and arrange to have your speakers checked. More from Focal: the assembly of its speakers uses poka-yoke methods to ensure it’s impossible for them to be wired incorrectly in manufacture. More specifically, ‘all of our Aria loudspeakers actually use specific Faston-clip terminated wires, to make it impossible to connect a single transducer in the wrong phase. 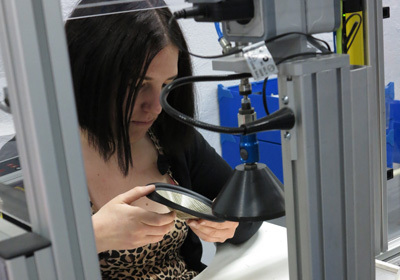 Furthermore, our QC performs 100% check at the end of the production line, also with frequency response check, so to ensure optimal performances, according to our golden samples. 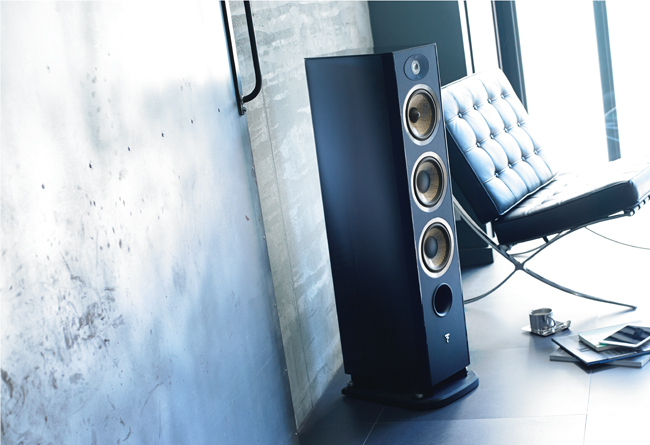 ‘Please also note that in the Aria 926 model, by design choice, midrange and tweeter are connected in phase, while the woofers are connected out of phase. ‘In fact, in order to obtain a smooth and regular frequency response it is necessary to consider the actual acoustic phase between each driver in the crossover region, rather than the absolute electric phase. Hi a long shot here, as it’s now 2016, and have just auditioned the 926s and also heard as a comparison the Monitor Audio Gold 200s, however I was wondering about placement? I can place them one foot in from the side wall and maybe 6″ from the back wall in my listening room, might this be enough room to avoid boomy base… I found the 926 really impressive and had a very deep soundstage and good separation for instruments, but were not as wide at the MAs soundstage. The MAs bass was substantially less but very well controlled and in the auditions room for the 926s on some tracks i.e. fast moving, driving rock, with lots going on… on occasion the bass was a tad, dull and blunted? (if thats the right term)… would foam inserts help out as am seriously considering buying the 926 over the Gold 200s. Can’t help thinking the 926s will be pretty boomy and bass-heavy in the position you suggest, and I’m not sure ‘socking’ the ports will help too much. Might work – really the only way to find out is to try the speakers and see how you get on. One lost question re my quest for new spks, hoping you might have heard the Spender D7s. wondering how ‘their sound ‘ might compare with rhe Aria, albeit different price bracket? I have been offered a very very good deal, but never heard Spender…by all accounts placement should not be a problem, wondering if the deliver as much detail as Aria. Sorry, but the Spendors aren’t speakers with which I’m familiar. anyone tried the 926’s or 948’s with linn source and MF amps? I heard the 948 and the sound was dreadful – was paired with a Luxman amplifier. I would strongly recommend that you try other brands. All of the hype related to Focal Aria must be purely paid advertising. I have the Spendor D7’s after having owned ATC SCM 40’s and they are brilliant. When I was looking for speakers, the Focal Aria’s were on my shortlist due to price. So I have heard both the Focal Aria 926 and 936’s and was not impressed at all. In fact, they are no contest to the Spendors. As always, a reaction to a speaker is dependent on the paired equipment, room acoustics and your own ears and preferences. I use my 926’s with a Naim Uniti2 unit, for which the 926 was voiced, and find it an excellent speaker still, even after 2+ years of ownership. I did listen to the D7’s at the time I bought the 926’s and they simply weren’t to my taste (a bit ‘slow’ and lacking sparkle). That does not mean they’re not a good speaker – just not for me. Dan – I object to my opinion being dismissed as paid advertising. You clearly have your own preferences but the Focal 926’s are a great speaker for the price and whilst there are undoubtedly better speakers out there they cost more money and are therefore not accessible to everyone. I listened to a Focal Chorus 714 s speakers at a stereo store listening room and found the upper treble sounds were absent only strong mid range sounds. 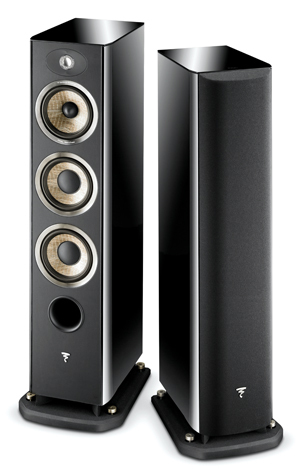 Salesman agreed with assessment and recommended Focal Chorus 716 s to cover the high frequencies. Have not been able to hear the 716 s? Anyone else experienced the same results? Let me have a question. Could someone recommend an amp for my focal aria 926? It sounds great when I listen to jazz but poor with rock:( My demo amp is rotel 1570 and seems like they do not match for rock music like Kid Rock or even Bon Jovi. Would Onkyo stereo amp solve my problem? Hi Andrew, I have a pair of Focal Air 906. My room is 12mq (4×3) and the hifi system is located on the long side of the room. I have had many speakers in the last 10 years (B & W, Audio Monitor, Klipsch, Paradigm, Cerwin Vega, etc.) but I have never been completely satisfied with the sound. The reason is that I mostly listen to rock music and I want to have the hammer on the low medium. The 906 me boom but I would like more. Do you think that buying the Focal Air 926 will I have what I’m looking for? I’m undecided between the 926 and the 936. What do you think is better suited to the kind I listen to? If you have any other little orator’s advice without any problems. Consider that the space I can give behind the diffusers will not be much …. maximum 30cm. Sorry for my bad English. I have been using the Focal 926 speakers for almost two years. My sources have remained a Cambridge Audio Azur 740c deck, and iTunes routed through the deck’s DAC, and a Pro-ject RPM 6.1 turntable with Sumiko MC cartridge. My amplifier was until 3 days ago a NAD C356BEE integrated, 80 watts. Irrespective of speaker placement, the bass felt wholly ballooned and uncontrolled, reminiscent of a 70s era ported bookshelf speaker. I ended up buying a Gallo TR-2 sub woofer and running mains out to it where a 80Hz filter kept the Focals above 80Hz and the Gallo below. It worked, but it did not seem right. I bought a Rotel RB 1080 amp and used preamp out on the NAD integrated to feed it. The Gallo was removed from the circuit altogether. Bass has been wholly transformed. I used the Focal test wmv files and bass extension is palpable down to 31 Hz, albeit who know how many DB down, but it can literally be felt. Previously it was totally missing. I’m shopping for a preamp with high and low pass filters, but in the mean time preamp 1 output feeds the Focals without frequency filtering and preamp 2 output feeds the Gallo sub with it’s crossover cranked down to its lowest setting at 50 Hz. There is overlap and some bass reinforcement, so I keep the Gallos level down so it doesn’t contribute to a big hump around 50Hz yet adds a lot of weight to tones 40Hz and below. It’s not perfect by far, but it’s a reasonable compromise until I can replace the NAD integrated with a preamp, likely the Parasound P5.